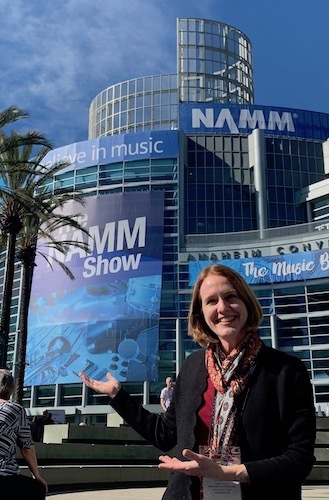 January 26, 2019, 2:54 AM · Every year in late January, more than 100,000 people from more than 120 countries gather in sunny Anaheim, California - just a block from Disneyland - for the NAMM Show, a vast display of music industry products, technology and talent representing some 7,000 brands. The show, presented by the National Association of Music Merchants (NAMM), includes interactive demonstrations, displays, live concerts and much more. 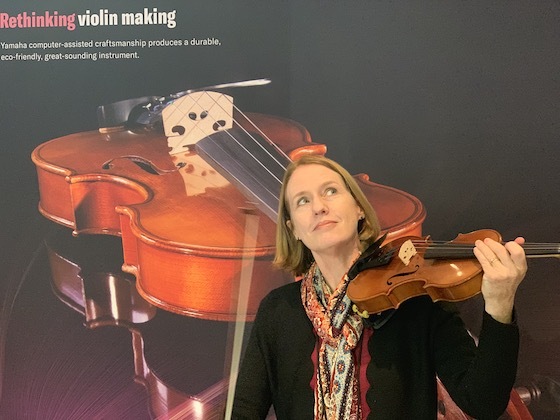 Violinist.com Editor Laurie Niles at the NAMM Show 2019. This is an especially good gathering for learning what the "latest" is - the latest innovation, the latest technology, the latest small improvement made to an established product. Knowing that I would be surrounding by technology experts, one priority for me was to visit the Yamaha Strings booth and find the right amp for the Yamaha Electric Violin that I bought several years ago. While I'd tried setting it up on a budget, I've since realized that I need a very simple amp that allows me to just plug in and practice. Once I get better versed at playing this fiddle, I can dive a little deeper into the special effects, loop pedals, louder amps, etc. Fortunately I arrived as a performance was beginning that featured the All-Star Trio, three electric instrument pros all playing on Yamaha instruments (and with quite a lot of gear! ): cellist Jacob Szekely and violinists Robert Anderson and Thomas Lea. L-R: Robert Anderson, Jacob Szekely and Thomas Lea. Next, having written about Yamaha's just-released new student violin, the YVN Model 3 Student Violin, I wanted to actually play it! After my time with Yamaha I headed to the giant show floor next door, where booth after booth displayed all things related to creating music: individual parts for all kinds of instruments, the instruments themselves, walls of guitars and fancy straps, drums, ticking metronomes, and noise all around. And of course there are strings. Strings! 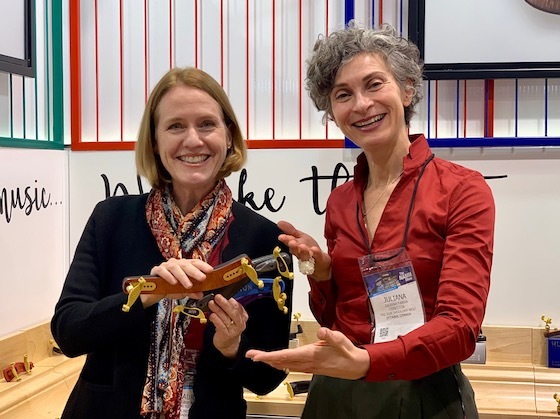 Last year at NAMM I met Annette Müller-Zierach, daughter of THE Evah Pirazzi, the person after which that string line was named. Would she be back? I needed to find Pirastro GmbH, the German company that makes Evahs (as well as the ever-popular Gold Label E string). Was she there? Yes indeed! 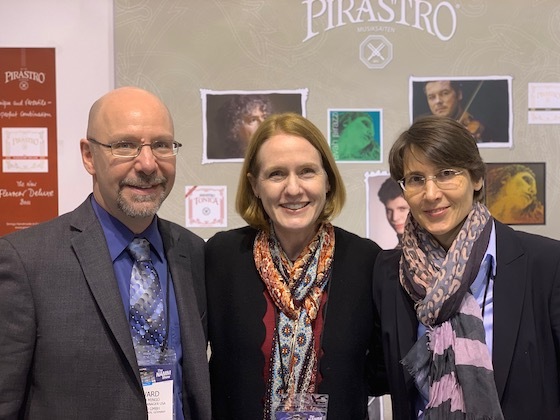 Ed Mingo, Laurie and Annette Müller-Zierach of Pirastro. I also discovered that Pirastro has come out with a new line of strings called Perpetual. The idea is a string that is more responsive and clear, said Pirastro Marketing Director Edward Mingo. Below, he talks more about the Perpetual strings, as well as the beautiful wooden (rather expensive!) Korfker shoulder rests, and some of the improvements that they've made to it. Heading back into the throng of people, I walked past little jam sessions, drumbeats, wailing saxophones, spontaneous business meetings at small tables. Eventually I found a cluster of booths related to the violin. There, I found what looked like an old friend: an entire booth filled with Kun shoulder rests! Many of my young students have used these, and having a quality shoulder rest available for a fractional instrument has been something I've long appreciated. Talking with Managing Director Juliana Farha, I learned that Kun has a presence in both London and Canada (they were giving away little maple leaf candies!) and they are working on creating the collapsible feature in the larger sizes, so we can get those rests into our violin cases! Laurie with Juliana Farha of Kun shoulder rests. 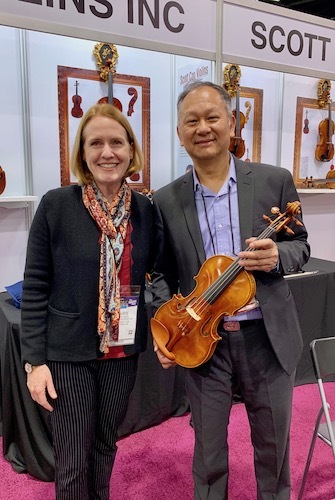 Around the corner I found another name that I know well: the violin maker Scott Cao, founder of the California-based Scott Cao Violins. I had never met him, but after seeing his name in so many of my students' violins, and recommending those violins for many years, I felt like I was meeting a celebrity! With violin maker Scott Cao. Cao has created a line of factory violins, and he also personally makes about nine fine violins a year. One of his hand-made violins was on hand (you see me holding it above) and so I played it. This was a truly lovely violin with a fine sound. What a pleasure to finally meet this maker! 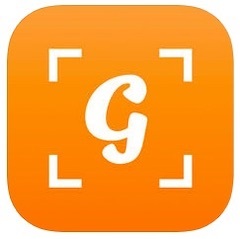 Not wanting to miss the pretty BAM cases, I headed in that direction, but when I arrived I was distracted by another of their products: an app they have developed called Gigs by BAM that can track your instrument as well as serve as a sort of social organizing hub for your orchestra. The instrument-tracking part of it requires the ($300!) purchase of a sensor/signal that goes in your case. Once you get it, you can track not only the instrument's location, but it also the temperature and humidity inside the violin case, which you can check at any time via your phone. The things that technology can do! 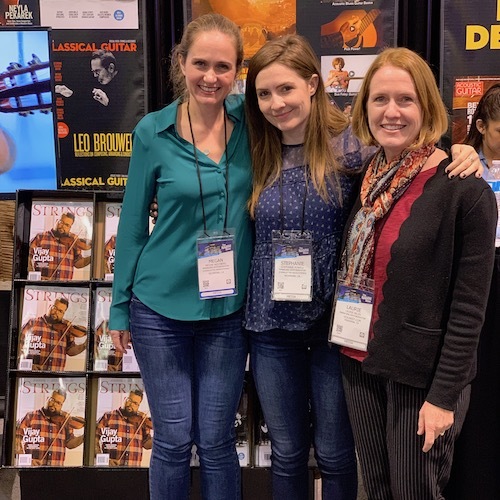 On my way out I visited editors Megan Westberg and Stephanie Powell from San Francisco-based Strings Magazine, where they were giving out the edition that features Los Angeles violinist Vijay Gupta. Megan Westberg, Stephanie Powell and Laurie Niles. 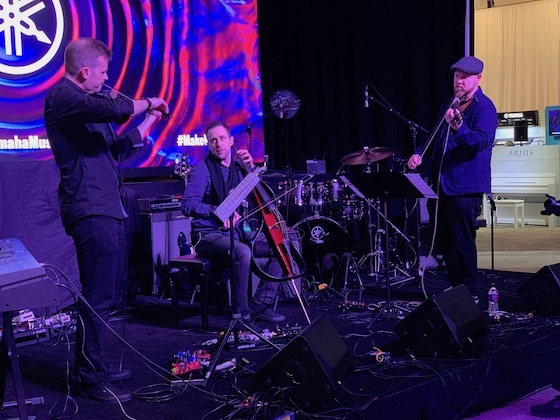 By the way the entire show opened on Saturday night with a show by Black Violin, a duo I interviewed several years ago comprised of Kevin Sylvester and Wilner Baptiste. I love what these guys are doing, with their emphasis on breaking stereotypes and bringing together genres. I offer you the short video below, which goes from Mozart to rock to rap (Cardi B! ), all in about a minute's time! The NAMM Show will continue through Sunday -- Click here for more information. Who is Evah Pirazzi? Mystery solved! January 26, 2019 at 01:15 PM · Thanks for these reviews. Wish I could have attended.Why do they always have these things on the west coast? :) I helped with a track for the Cakewalk booth.Those are a great bunch of guys! Yamaha is coming out with some very useful tech for the violinist.The Yamaha amp looks very interesting and is probably a nice addition to any violin electric practice setup.I would be interested to hear a review later on that covers an "in use" review say after using one a few weeks. (1) Instrument & bow, (2) Overpriced preamp, (3) Amplifier, (4) Loop pedal and maybe a couple of stomp boxes, (5) Rakish hat. January 26, 2019 at 04:46 PM · Regarding the Yamaha amp, and I've said this here before, before you go and buy a THR10 for your violin, take time to familiarize yourself with it's sister, the THR5A. Why? Because adjacent to the "flat" setting that Jacob pointed to on the THR10 is a setting called "Aco," which stands for acoustic. This setting models a MICROPHONE, unlike all the other settings except "Flat," which model electric guitar amps. Electric guitar amps typically don't sound good for violins. The THR5A has four microphone modeling selections, all of which sound great with violins. I can only urge you to take the time to try both amps side by side and see which one has more to offer for your violin. And the THR5A is smaller, lighter, has the same speakers and power output, and costs $100 less that the THR10. Yamaha produced several videos to demonstrate their YEV violins when they were introduced, and they used the THR5A for that. And I could also point out that the THR5A is the only one of the five THR amps in the series that electricviolinshop.com has chosen to offer in their curated collection of amps. JMHO. January 26, 2019 at 05:55 PM · Wonderful blog and great photos! You look adorable next to Cao. If we didn't know it before, you have now outed yourself as the consummate violin groupie! But Cao seems quite worthy of the adoration. Mark, great tip, I will investigate! Diana, his student violins have served well, and from the many fractional violins I've seen, they are not easy to do well. And his bench-made was a real violin, very nice. Respect!